Setting out for Victoria from the Foot of the Lochside Trail. Last weekend we had the absolute pleasure of making a presentation in Victoria, BC; sharing our story of a car-lite, multi-modal lifestyle. It was a whirlwind weekend, packed with meeting many wonderful people who are passionate about moving the cycling conversation forward in their city, a lovely and scenic group ride, and even a quick radio appearance on CBC's All Points West. While each of these were important moments, and expanded our worldview of what other cities are working towards to improve cycling as a safe and viable transportation option, it was the activity that sandwiched the entire weekend that really broadened our horizons. Taking Our Bikes on the Canada Line to Bridgeport Station. You may be wondering how it is a family of four who doesn't own an car gets from East Vancouver, across the Georgia Strait and then to downtown Victoria? Well, we woke early Friday morning and embarked on one of family's most epic and most multi-modal journeys. Starting from our home in East Van, we rode the short trip on our bikes to the Canada Line, and headed south to Bridgeport station to do one of many firsts the weekend would hold. I feel slightly abashed to admit that in the years I have been riding a bike throughout Vancouver, I had never once put my bicycle on the bus bike racks. The whole act had always seemed so daunting, and I preferred just to ride the extra distance than worry about the hassle. However, cycling with our young children along Steveston Highway is just not viable, so our only option was the 620 express bus to Tsawwassen Ferry Terminal. So, with help from my much calmer husband, we attached our bikes to the bus rack and set off for the initially nerve-wracking ride. I'm very happy to report that my lovely Papillionaire, and the rest of the family bikes, made it safe and sound to the ferry. Before I go on with our journey, I feel compelled to give a warning to other groups looking to make the same trip we did. Each bus can only hold two bicycles at a time, which means our family had to split up. We lucked out that due to the early hour we left, we were the first four bikes at the stop, and the next buses conveniently were only 15 minutes apart. If we had not been there first, the 620 only runs on the 45th minute and on the hour during peak hours, meaning a potentially lengthy wait. There are other buses that travel to Tsawwassen, but they drop off about five kilometres from the terminal, leaving a short ride after the bus travel. So be sure to plan ahead! The View from the Top Deck of the Spirit of Vancouver Island. After our bus trip, we boarded the ferry and docked our bikes on the in the hull, and headed up to the top deck to enjoy the morning crossing on a beautiful sunny day. Riding the ferry is such a wonderful way to experience the spectacular landscape of the Pacific Northwest, and is something we don't get to do very often. You're surrounded by water, with a horizon lined with the majestic coastal mountains, and standing on the deck with the wind in your hair is quite an ethereal moment. As an added bonus, this summer BC Ferries has Naturalists on board offering presentations focused on BC's natural world for children. Our daughter has quite a love for animals and sea creatures, and was completely enthralled by a geological discussion. As our presenter, Colleen, bemused, it "rocked"! One of the More Pleasant Stretches of the Lochside Trail. As we reached Swartz Bay, we returned to our bikes in the hull, and once the ferry was docked, set off on the endurance challenging part of our trip. 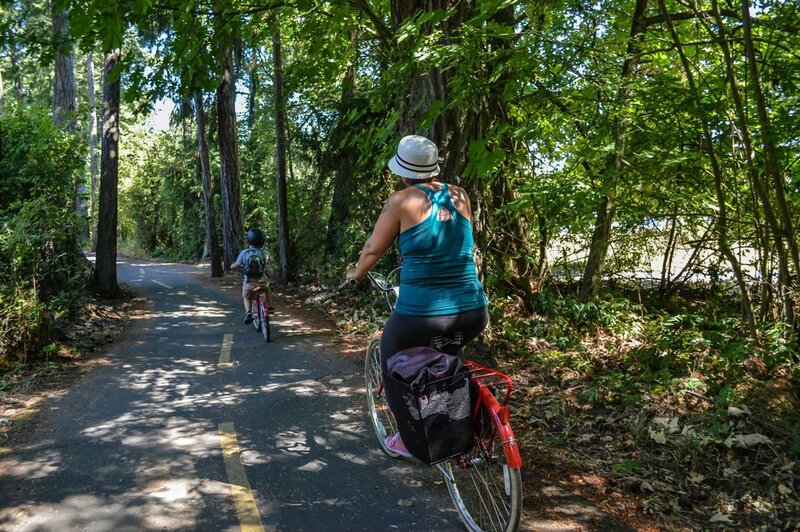 You may be familiar with the Lochside Trail, a cycle route that takes you from Swartz Bay along shared roads, painted bike lanes and separated and multi-use paths all the way to the Galloping Goose Trail and into downtown Victoria. In total, the trip is thirty-five kilometres of riding, some of which is paved, some gravel and even some wooden bridges. The route is quite spectacular, taking you along waterways, past farmland, and through seaside towns like Sidney, with the Gulf Islands scattered along the landscape. There are points along the route that we would have liked to see a bit calmer. Specifically many of the painted lanes that took us and our young children along some busier roads, and left us rather nervous until we returned to the calmer areas and completely separated pathways. And admittedly, the pathways that ran parallel to the highway were not ideal for noise and scenery, but one can't complain too much when there is a great option to get from Vancouver to Victoria without the need for an automobile. These Guys Never Cease to Amaze and Inspire Us. Most amazingly, and further proof how amazing young people are, our children made the entire trip on their own bicycles with little to no complaint. In total, including our return journey home on Sunday, our little monkeys rode approximately one hundred kilometres. As parents, we really couldn't be prouder of their resilience and willingness to put up with their crazy bike riding parents. I think that sometimes we take for granted how remarkable they can be, and this weekend we were truly thankful to be in their company. Sharing the trip with them made it so special, and left both Chris and I feeling like we have accomplished something very extraordinary in how we've been raising our children. Where Will the Next Two-Wheeled Adventure Take Us? After a couple day's reflection, and a chance to rest our weary legs - somewhat - I think back on this last weekend fondly and with pride. As a family, we experienced a new way to travel, a new city, and new people. But what this trip has also done is expanded our horizons on the trips we can achieve as a family. For years we have toyed with the idea of a cycling road trip, whether to go camping, or stay in other cities. After this weekend, and having experienced multi-modal transportation at it's best, I am confident that the years to come will see the Bruntlett family embarking on many more extended bike trips. I know that the infrastructure is there to support the times when riding our bikes is not an option, and that our whole family, including our children, are more than capable of long rides, complete with a little extra gear. I certainly feel our world just got a little bigger, and am so excited for what future adventures we will share! To see the full collection of photos taken on our journey, please visit our Facebook page.